Nicotiana rustica, Tobacco was probably the most well known plant in the Americas. This was a very different tobacco from that commercially available today (Nicotiana bigbucks). Nicotiana rustica was used for hundreds of generations and virtually every native american tribe used tobacco; as an offering to the spirits when planting or gathering food, for healings and for ceremonies. 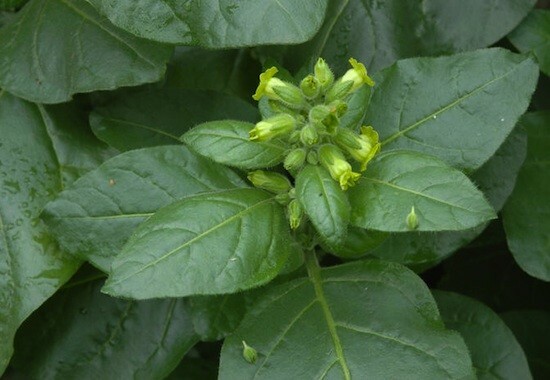 The sacred uses of Nicotiana rustica are different for many tribes but a basic truth remains, Tobacco was medicine, used for prayer, protection, respect and healings. In many Indian rituals, ceremonies, and religious observances, Nicotiana rustica was the unifying thread of communication between humans and the spiritual powers. Tobacco also sealed peace treaties between tribes and agreements between individuals. For such a purpose, the chief often kept a special pipe with a long decorated stem, "Peace Pipes". It was an important Shamanic tool throughout the amazon. Used alone for its entheotic powers or sometimes smoked during Ayahuasca ceremonies or added to the brew. The smoke itself was thought to be sacred and purifying, and tobacco was often burned to purify and protect, even if not inhaled.